First-year students playing “Quad: A Game of Conversations,” designed by MFA student Carly Hagins. 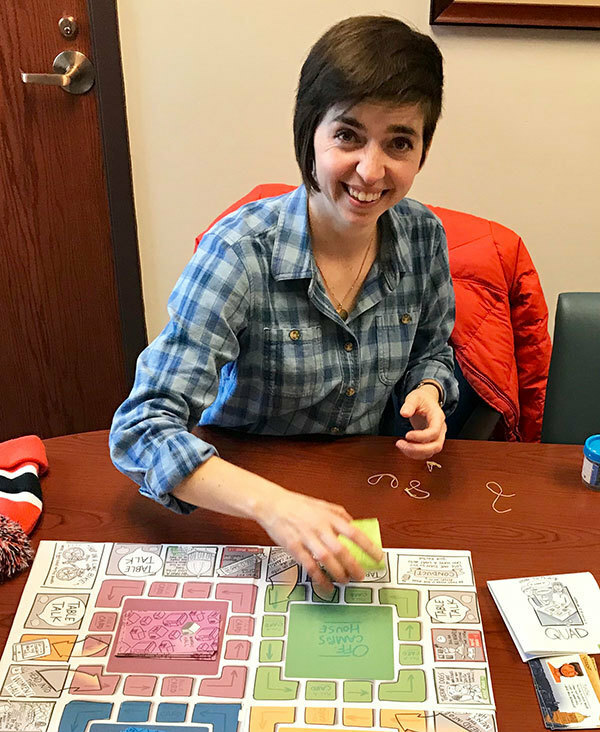 For Carly Hagins, the best tool to help Notre Dame first-year students learn about campus culture is a board game. Throughout the month of March, students in the Moreau First Year Experience course have been visiting the McDonald Center for Student Well-Being to try out a new board game created by Hagins, an MFA student focusing on industrial design. “Quad: A Game of Conversations” works to spark discussion between players about social life at Notre Dame, in the hopes of breaking down the initial misperceptions that often lead to unhealthy drinking habits. Over the course of three weeks, more than 600 first-year students played the game. 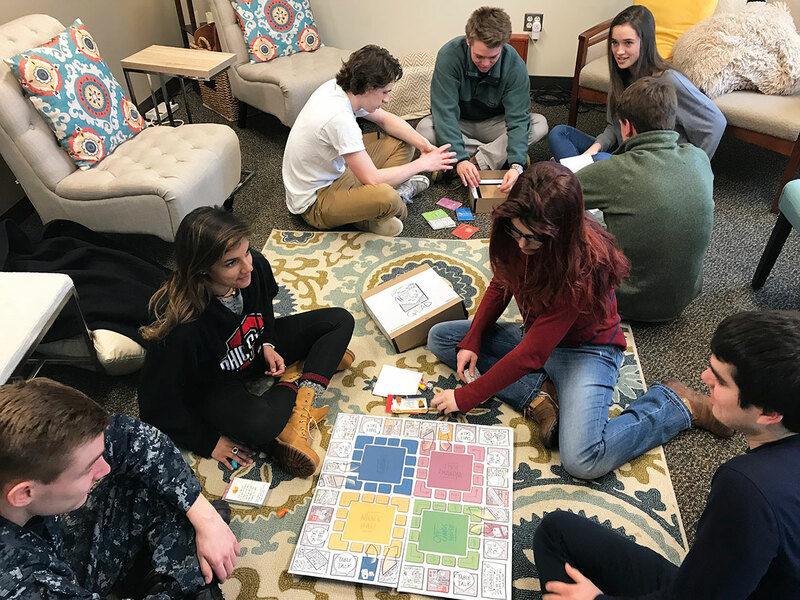 Upon arrival, students were given an introduction to the McDonald Center for Student Well-Being before splitting up into random groups to play. The game has several categories of cards — ranging from “Off-Campus House” to “Women’s Hall” and “Men’s Hall” — to direct conversation. The categories include both trivia questions and open-ended questions, all focused on minimizing the barriers that often arise when discussing sensitive subjects, such as the drinking culture on campus. The majority of students who played the game reacted in a very positive way, saying both in person and via anonymous survey that they would play it again, Gehl Jones added. And the center is already planning to use the game again next year. From the dozens of cards to the game board, Hagins hand-crafted every piece, except the dice. Hagins conducted extensive research to come up with the game and ensure it is as relatable as possible. By interviewing students and keeping her ears open around campus, she was able to pinpoint the little things that makes Notre Dame’s social culture so unique. Once her research was completed, Hagins began the process of designing the game. From the dozens of cards to the game board, she hand-crafted every piece, except the dice. 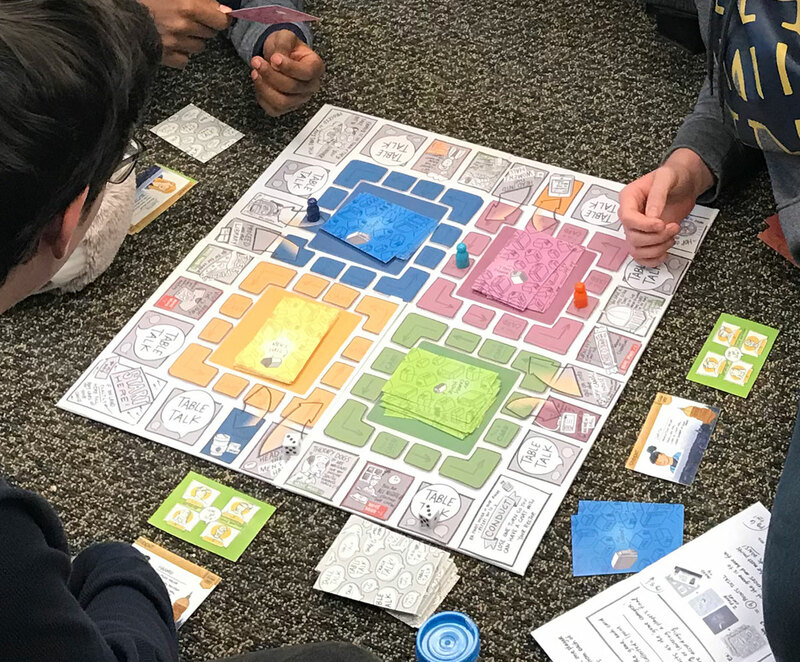 “This game actually takes all of the things I’m interested in and combines them into one project,” said Hagins, who prior to attending Notre Dame worked as an assistant professor at Wentworth Institute of Technology, a toy designer, and a graphic designer at a brewery. Though still in the testing stage, Hagins hopes to produce more versions of the game so that it can be fully incorporated into the Moreau First Year Experience, as well as other first-year events such as Welcome Weekend. Originally published by Teagan Dillon at al.nd.edu on April 18, 2018.